Explore the open world of Lunch Truck Tycoon 2. Win all 12 competitions, earn the trophies for all 6 regions, find all of the hidden gems, and much more. 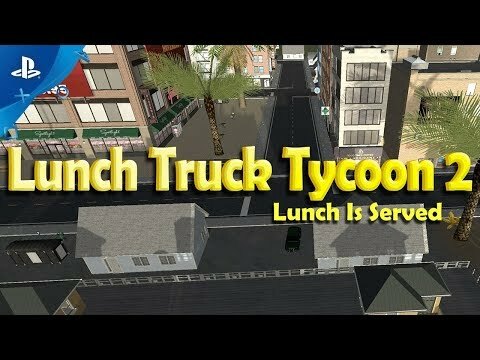 A Simulation Tycoon game that puts you in control of a lonely Lunch Truck. Expand your franchise and become the Grandmaster of Lunch Island. With Maliciously Rotten, you are tasked to track down the source of the rotten food and who is selling it to the lunchers. Make deliveries, sell items and find objects are all part of the Story Mode in Lunch Truck Tycoon 2. Lunch Truck Tycoon 2 will feature a Dynamic Economy that allows for an ever changing environment. Prices are constantly changing, therefore so are your profits. A hamburger needs beef, but the latest shipment hasn’t arrived yet and the demand is causing the price to go up. What do you do? Push the expense off to the customer or acknowledge the fact that you will be losing profit till the situation is resolved. Compete against the clock to unlock signature items! Discover the recipe, then discover the amount of ingredients needed to craft the signature item. If you complete the challenge, you will then be able to craft the signature item and sell it to the lunchers. These sought-after items can be sold at a much higher price, therefore creating a higher profit margin. Not all lunch is easy to distribute amongst the lunchers. That’s where your delivery service comes into play! See a luncher in need? Grab the delivery request from them and then setoff to your destination. Get there in time to receive the delivery bonus or receive nothing at all! Be sure to have the right truck for the job as speed is a big factor in this game mode. With an active day/night cycle, lunchers are always on the move. From morning rush hour in the suburbs to the lunch traffic in the city to the after-hours hot spots in the slums. Finding where the lunchers are gathering can make or break your day. Once unlocked, you can drive over to the catering building and grab a new catering gig. Here you will have to put together a larger order, then deliver it to its destination. Don’t worry, you have several hours (in game hours) to complete the gig! But if you don’t, you can potentially be stuck with a surplus of product. Events popup all over the Island at any given time. For example, the game just ended and there will be a mad rush of lunchers leaving the arena. Head to the arena’s main entrance to take advantage of the situation.